In a survey conducted over 2017 and 2018, Humanity & Inclusion, an international NGO that provides humanitarian aid to the disabled, they reported that "60% of Syrian refugee households include a person with a disability, and 1/5 of refugees in Lebanon and Jordan have a disability." 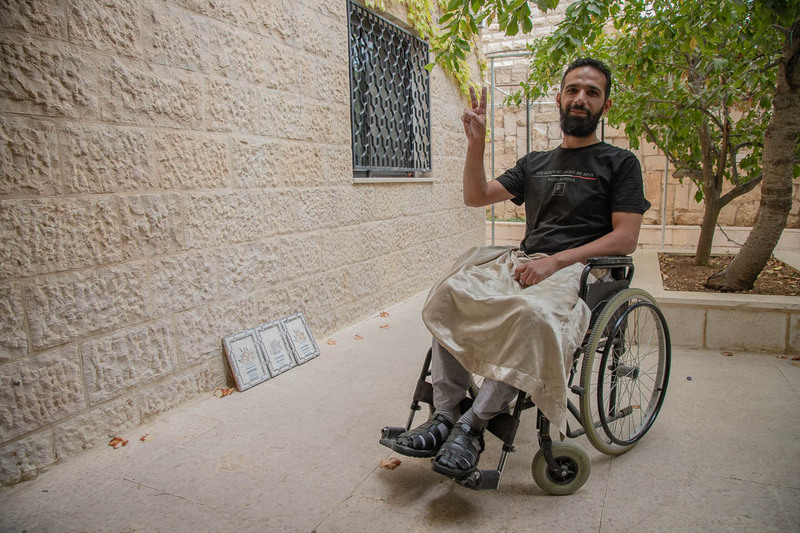 About a 1/3 of those reported that their disability stems from the conflict in Syria. The Alalusi Foundation partners with Souriyat Across Borders in Amman, Jordan to provide for the needs of the disabled. In January 2013, Mohammed was leaving his local mosque in Syria having just attended Friday prayer when a car bomb went off in the central square knocking him to the ground. Scores of other people were wounded in the blast and many killed. Mohammed drifted in and out of consciousness. With all his energy, he tried to get up but was unable. Searching among the victims, Mohammed's friend found him lying in the street, covered in blood and surrounded by rubble, broken glass, and burning paper. Fifteen minutes have passed since the explosion. His friend was calling for a car to help Mohammed when a second car bomb went off, injuring more people in the area. The car arrived and Mohammed was laid in the back, the driver instructed to rush to the Jordanian border with him. During the journey, Mohammed recalled coming to, his body and mind feeling disconnected from each other. His friend stayed behind to help others. At the border, Jordanian military moved the unconscious Mohammed to their ambulance and brought him to a military hospital in Irbid, the first major city in Jordan, where he would spend three weeks before being transferred to a civilian hospital in Amman and recover for another two months from severe damage to his spine that left him unable to move his legs and other changes. By the time he was discharged, Mohammed's wife and daughter had finally been able to move to Amman where she was able to rent an apartment for them. She told him that, when members of their community caught the man who set the bomb that disabled him and killed others, they discovered he was a government worker. I asked him for some examples of things he had to learn. Slipping back the lap blanket that covered his legs, he motioned to a urostomy pouch that hung on the right side of his wheelchair and stated that “using the toilet” was very important. Additionally, at first he had great difficulty going to bed and showering without considerable help from his wife. Once the realization hit him that his disability will be a permanent fixture, he understood that he had “no option but to accept” the challenges. A part of his strategy was to not isolate himself. In a new land and with a body he must relearn, he sought out new friends and was social in order to help him from becoming discouraged. Unlike most refugees who are disabled previous to or as a result of the conditions that made them flee, Mohammed had a decent amount of savings as well as resources in the form of sheep still in Syria that generates some income. As a result, he was not forced into an all too common situation of having to rent an apartment that is inadequate for his needs. He lives in a first-floor apartment with his wife and growing family of children and has made changes to its layout including building a ramp so that he can come and go into the street independently. But Amman, Jordan is exceptionally hilly making mobility challenging for anyone. He mentioned that he can’t go to the bakery for his wife or to his friends’ homes. They always have to come to his. Furthermore, a nearby park with his daughters is inaccessible. With a sigh, he told me that, even if he could, he feels bad that he can’t play with his children the way they want him to, or to help his wife. Often she comes home from a long day at work and is exhausted. He wants to be able to help her more but activities like grocery shopping and picking their children up from school is not possible for him. Even going to government assistance offices is difficult or impossible because most require climbing stairs. During a hospital visit a few weeks before, he couldn’t use their toilet because the doorway was too narrow for him to enter in his wheelchair. In the six years in Amman, Mohammed's nightmares of the past have diminished. What keeps him awake at night now is the future for him and his family. In his flight to Jordan, he left behind his parents, siblings, and extended family. His father died three years ago. His mother and brother, a doctor, remain in Damascus and Mohammed is able to stay in touch with them via WhatsUp. He mentioned that his phone is his most valuable possession because it affords him contact with those in Syria and another brother who is a refugee in Turkey. Their lives are precarious as a result of problems with official documentation. Mohammed's worst nightmare is being forced to return to Syria and his children being subjected to the ongoing violence.